2. Place flour, baking powder and salt into a mixing bowl and whisk together. Set aside. 3. Place butter, cream cheese and sugar into a stand mixer fitted with a paddle attachment and cream together until light and fluffy. 4. Scrape down the sides of the bowl and add the egg yolk and vanilla. Continue to beat together. 5. Add the flour mixture to the butter mixture and mix together until completely combined. 6. Form dough into a disc, wrap in plastic wrap and refrigerate for 30 minutes. 8. Place balls of coconut covered dough onto a parchment lined baking sheet, 1 1/2 inches apart and gently press your thumb into the center of each dough ball. 9. Bake cookies for 13 to 15 minutes or until coconut has turned golden brown and cookies have just baked through. Remove from oven and carefully re-indent thumbprints into the cookies, if needed. 10. Transfer cookies to a cooling rack and cool completely, about 30 minutes. 11. 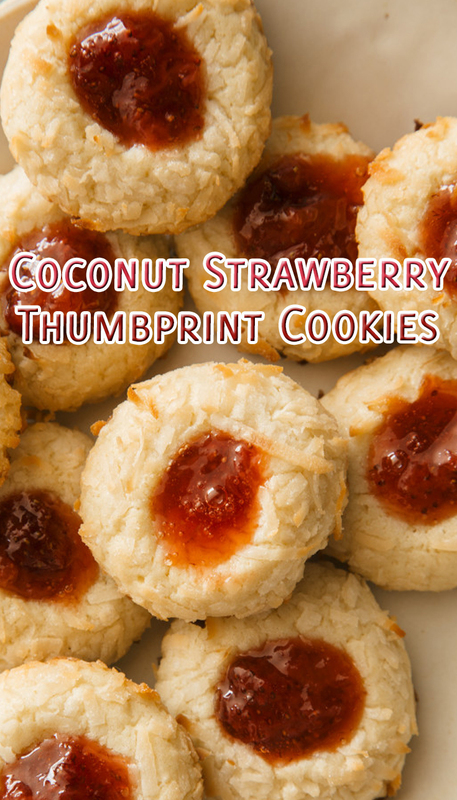 Fill each cookie with strawberry jam. Serve.